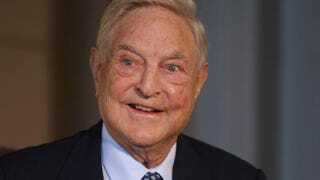 Liberal billionaire George Soros has donated $33 million to social-justice groups in recent months in an effort to draw attention to police violence in the black community in cities like Ferguson, Mo., according to the Daily Mail, citing a report at the Washington Times. Ferguson ignited a national debate about police violence in August after then-Police Officer Darren Wilson shot and killed unarmed black teen Michael Brown. The donations came to light after the Washington Times conducted an analysis of the latest tax filings by Soros' Open Society Foundations, the report says. The analysis found that the private foundation made donations to different groups that have weighed in on the police violence and institutional racism, including professional groups in Washington, D.C., and New York City, whose organizers were bussed to Ferguson to manage the messaging and media coverage of events, the report says. The money reportedly helped boost the number of protesters in the community over a period of months by bringing in outside activists, the report charges. And think tanks reportedly used their own online news sites to cover the civil unrest and link it to the police killings of Eric Garner in Staten Island, N.Y., and Tamir Rice, 12, in Cleveland, the Daily Mail writes. The director of Soros' fund said that it has no direct control over the groups it gives to, and said that they are all trying to improve accountability, according to the report. "Helping groups combine policy, research [and] data collection with community organizing feels very much the way our society becomes more accountable," he told the Times. "The incidents, whether in Staten Island, Cleveland or Ferguson, were spontaneous protests—we don't have the ability to control or dictate what others say or choose to say."